Time for the weekly weight loss update once again. 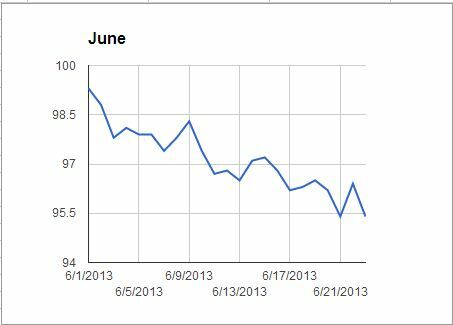 In last week I had a quite okay weight loss and the total for the month of June so far was quite on track. Started June with a weight of 99.6 kilos and last week I was at 97.2 which is 1 kilo weight loss per week. For this week I had hopes on loosing a little more than 1 kilo and that I could reach 95.X kilos. With plenty of exercise this week and also a little more walking due to the nice weather that was expected I put this as a reasonable goal. For this week since I have been having a little pain in my back I had planned to skip the weight lifting exercises for the back and instead put more focus on legs with two planned leg trainings sessions. The first one was a 10 set Squat training set where I was going on a little lower weight than usual but since it is a total of 10 set it will still be a really good workout (which I can even today still feel in my legs). Then on Tuesday this week I continued with a good chest weight lifting program where I as usual focused on the dumbbell chest press. This week also I made my second attempt at going up in the weight of the barbells. I have tried this one time before but then it was a total failure. The weight increases in the barbells are starting to get quite big now. Compared to the barbells I am using right now the next step is an additional 7.5kg increase in each barbell. Managed 3 reps which I think was an excellent result for this week. On Thursday I went back to the gym for some additional leg training and a little bit more chest exercises and I also took another round on Saturday to go for a little back training, some arm training and a little more leg training. Also have plans to go there for today (Sunday) but not decided what to train for today since most muscle groups are quite tired. For the weight loss the week started out quite good and already after 2 days I was down at 96.2 kilos. Stayed at around 96.2-96.5 for the coming days until I dropped down to 95.4 kilos on the Friday. In the Friday evening we had a small celebration with a big salad buffet so gained back most of it and ended up at 96.4 kilos on Saturday morning. Just took a check this Sunday morning and was back on 95.4 kilos so think I and well on my way at going sub 95 kilos in next week. In total a very good week but from weight loss and weight training and looking forward to another great week coming up now. Stay tuned for the next weight loss update coming in the end of this month with a full monthly update and also an update to the total progress for my keto weight loss.